Longines created a large, sturdy multi-part case for military watches in the 1930’s and attempted to sell these to European air forces, especially the highly-developed Czech military. 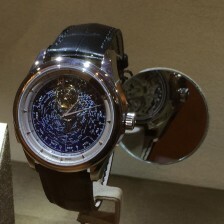 The case is extremely oversized by standards of the day, housing a 34.7 mm (15 ligne) pocket watch movement. But this was perfectly appropriate for the burgeoning market for aviation watches. More unusual is the multi-part “Tartarugone” (“big turtle”) case: The movement, dial, and crystal are contained in a steel cushion-shaped inner case. This fits into a similarly-shaped outer case with lugs and a conventional snap-on case back. The result is an incredibly sturdy and anti-magnetic case that presages Gerald Genta’s famous cushion-case multi-part watches of the 1970’s. With the Czech Air Force contract in hand, Longines began producing these watches in volume. The case back is marked “Majetek Vojenské Správy”, or “Property of Military Administration”, though apparently the company skipped this engraving amid increased demand during the war. It is the presence of this engraving that gives this type of watch its name: Majetek. Longines began production using their common 5.65 mm Cal. 15.94 but switched to the thinner 4.5 mm Cal. 15.26 for a second series. This movement was not produced in much volume due to the Great Depression and was perhaps too fine for a military timepiece with its gold-plated bridges. Once the Czech military specifications were in, Longines switched to the cheaper Cal. 15.68, and this is the movement found in most military-issue Longines “Tartarugone” watches. The Longines Tartarugone is quite ornate, with a coin-edge outer bezel around the crystal and enamel dial. Due to issues with cracking, Longines used an especially-thick layer of enamel, but even these show signs of serious wear today. The hands are also quite a bit more ornate than one would expect in a military timepiece. As was done with most other military timepieces during World War II, a second producer emerged to supply additional stock. Eterna, one of the largest producers of Swiss watches at the time (along with Longines) began producing “Majetek” watches as well. The Eterna “Majetek” differed substantially from the Longines: It features a more-modern center-seconds movement (Eterna’s 14 ligne Cal. 852S) and much-simpler case. Although similar in shape to the Longines Tartarugone, the Eterna Majetek case is a single piece with a conventional screw-on back. It also lacks the coin-edge bezel around the crystal and has less-ornate dials. Although known for the “Majetek” engraving on the back, many Eterna and Longines watches lack this signature. Even some with known military history might not be marked with anything but a serial number. And those serial numbers often pre-date the watch by up to a decade! This makes it somewhat difficult to evaluate a Majetek or Tartarugone today. Don’t be surprised to see cracked dials on the Longines but be wary of re-touched lettering or incorrect hands. And make sure you see the proper movement inside! This Longines Tartarugone, offered at Chronocentric for E1,900, is a good example. He shows the multi-part case, 15.68z movement, and seemingly-correct markings. This $2,200 example in the USA looks good too. Examples of the Eterna “Majetek” are quite a bit more difficult to find. This example on Chrono24 is worn but acceptable, but the movement is not shown and certainly is not “chiming” as indicated in the ad. But it does show the lower pricing one can expect with an Eterna, being listed at $1,800. Still, I would wait for a better example. Another option for someone looking for a Majetek “wearer” is the modern Eterna Heritage Military 1939. A mostly-faithful reproduction by the re-born Eterna, the Heritage Military has the right Eterna case and dial look. And it uses a modern ETA 2824-2 movement, which is derived from Eterna technology of the 1960’s. I don’t like the PVD black model (there’s no historical equivalent) but the brushed steel is nice. And it’s an automatic, unlike the classic models. I don’t like the tiny date window, but modern buyers might. Although the Eterna Heritage Military 1939 is listed with an MSRP of $2,140, it is not difficult to find a discount on modern Eterna models. I’ve seen this watch listed under $1,500, including a few on Chrono24 right now.